Amigos de los Ríos engages community volunteers of all ages and backgrounds. 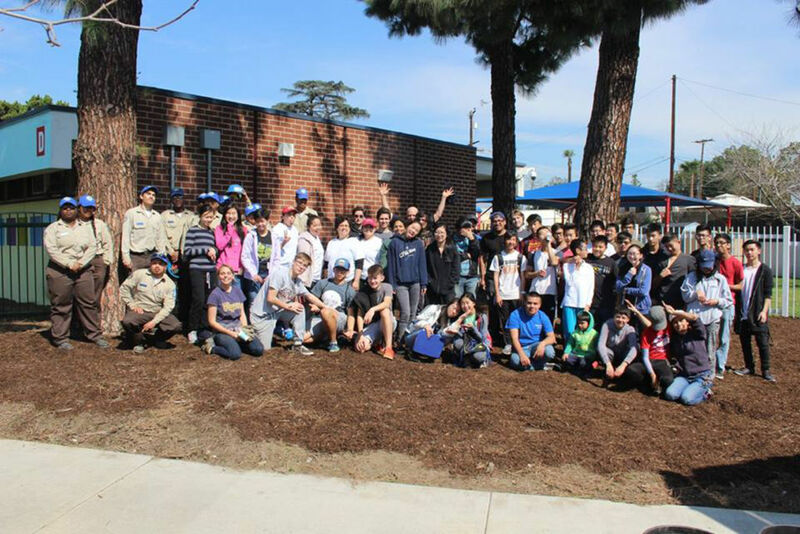 This photo includes volunteers from the California Conservation Corp, Baldwin Park HS, Boy Scout Troop 111, Phi Alpha Honor Society from USC, Community members, Arcadia HS APES, Ramon Cortinez HS, St Agnes, and CSULA. Photo provided by Amigos de los Ríos. The San Gabriel River drains a 713-mile watershed in the San Gabriel Mountains, flowing as far south as Long Beach, where it enters Alamitos Bay as a tidal river. It shares its watershed with two other major rivers: the Los Angeles and the Santa Ana. The river and its tributaries are home to several native threatened or endangered species, including the green sea turtle, the steelhead (rainbow trout), and the mountain yellow-legged frog. For thousands of years, the river has sustained human populations in the area, and was the homeland of the Aztecan Tongva Native American tribe. In the 20th century, the Army Corps of Engineers heavily channelized the river, constructing a total of five dams and confining the river’s full length south of the mountains with concrete canals to control its seasonal floods and stabilize its course. This led to total lack of green space in urban areas along the river, where many residents are not aware that they live in a floodplain, nor that they live in a vast, vital watershed that connects the local mountains to the sea. In 2005, Amigos de los Ríos introduced the initial Emerald Necklace Vision Plan, outlining a detailed strategy for the development of a 17-mile loop of beautiful multi-benefit parks and greenways connecting ten cities and nearly 500,000 residents along the Río Hondo and San Gabriel River watershed areas located in East Los Angeles County. The Emerald Necklace is a collaborative effort between city agencies and organizations working to restore native habitat along the river, while also providing usable green space for people living in surrounding neighborhoods. Working with the cities of El Monte, South El Monte, Baldwin Park, Whittier and Irwindale, Amigos de los Ríos was able to complete ten separate parks and trails under the original plan. In 2008, Amigos de los Ríos introduced an Expanded Plan, compiling existing plans and data, identifying best practices, and outlining collaborative priorities for further expansion and development of the Necklace. These included increasing tree canopy and providing unincorporated neighborhoods with access to trails and other features. In 2013, Amigos de los Ríos was awarded a $10,000 EPA Urban Waters Small Grant to plant trees and native plants along the San Gabriel river. The organization also hosted weekly workshops, volunteer projects, and other forms of outreach in East County Los Angeles. 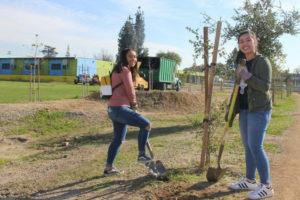 Under the Urban Waters Grant, Amigos de los Ríos focused on an area comprised of five schools, four parks, and one recreational trail. The green spaces along the river in this area connect the cities El Monte, South Gate, Maywood, and unincorporated areas of East County in Los Angeles. 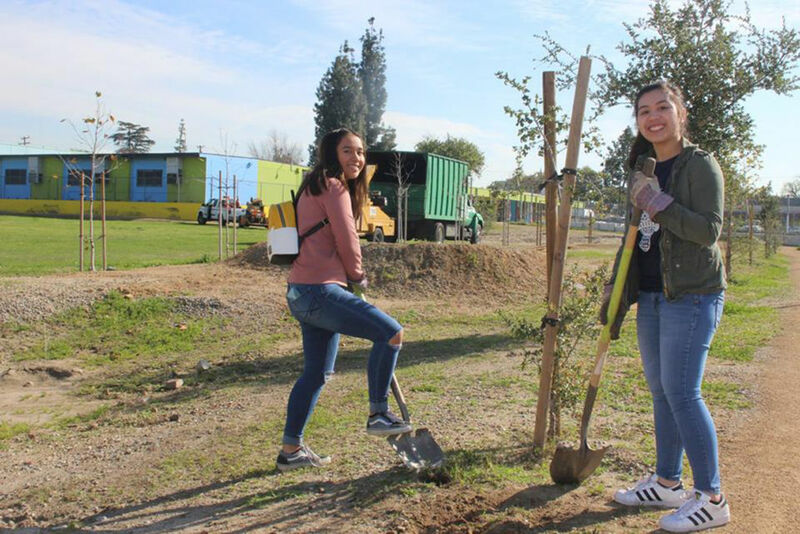 Amigos de los Ríos volunteers plant trees along the Emerald Necklace near the Mulhall Elementary School in El Monte, CA. The massive effort is inspired by Frederick Law Olmsted Sr., who designed usable parks and green spaces throughout the country, including New York City’s Central Park. In 1930, Olmsted contributed to a plan for Los Angeles County that was never implemented. For thirteen years, partners have been working to establish a network of walking and biking trails, equestrian trails, multi-purpose green space, water management demonstrations, habitat enhancements for local wildlife, and educational opportunities through outreach, cultural events, and job training. To this end, partners have transformed quarries, blighted lots, and other derelict spaces into beautiful usable park space. Once completed, the Necklace will encompass 7,500 acres of land, extend to Catalina Island in the Pacific Ocean, and serve sixty-two cities in the region. The primary role of Amigos de los Ríos is to serve as a liaison between the community and public agencies. In this capacity, Amigos de los Ríos has not only incorporated health, recreational, and educational opportunities into the Emerald Necklace, but has also worked to ensure that the Emerald Necklace is a Cultural Heritage Corridor. Park signage incorporates information about local history, and green spaces have been designed with accessibility in mind, with safe trails incorporating local schools and transportation systems. In the words of Amigos de los Ríos, “We need to work proactively together towards an ‘Environmental Renaissance’ to reverse environmental degradation, connect communities to opportunities for recreation, and make a commitment to completing this wonderful network of parks so as to re-establish a balance of open space and urban development for our region’s prosperity, economic health, and sustainability.” The Emerald Necklace will have an enormous impact on the health and well-being of communities in the watershed by providing opportunities for exercise, education, transportation, and celebration of cultural heritage. It will also provide a positive example for other urban communities who are working to address environmental and social grievances in underserved communities, while creating safer and happier cities overall. Amigos de los Ríos. 2005. Emerald Necklace Green Infrastructure: Los Angeles County. Amigos de los Ríos. Expanded Vision Plan. Amigos de los Ríos (AMIGOS) is a 501(c)3 non-profit organization committed to protecting and restoring open space in the urban environment by creating an Emerald Necklace green infrastructure network of parks and trails throughout the Los Angeles Basin to connect the Mountains to the Sea. Our efforts are combating public health issues exacerbated by a lack of green infrastructure in East County Los Angeles.